‘WATCH IT LIVE’ EVENT TONIGHT NOW AVAILABLE FOR NJ TOO! 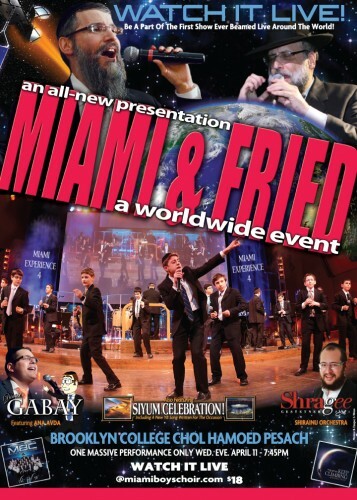 The Miami- Fried Pesach show ‘Watch it Live!’ is now also available to be seen in New Jersey AND surrounding areas. Join thousands of families worldwide who will be watching it live tonite Wed. April 11 from Brooklyn college 745pm. Get to the website early enough to register, get your password through your email, and pay with your credit card. Then you will be ready to enjoy the show, and for some additional fun, email comments during the show – that the MC will read some as the show progresses. Make sure to write which city you are watching it from! $15 if you register before 5pm. After 5pm $18. Join participants from all over the world for the first time ever live streaming event!